Hainan Airlines represents the largest privately owned air carrier in China having originally been created out of the nation's largest special economic zone in 1989. In recent years Hainan Airlines Group has started up or taken over several smaller airlines which generally operate under a similar branding. As of 2007 the parent group created Grand China Air and at present, although the airline is very small, it is expected to become the primary name within which Hainan Airlines, China Xinhua, Shanxi and Chang An Airlines operate. As of 2014 however Hainan Airlines continues to use its own name. 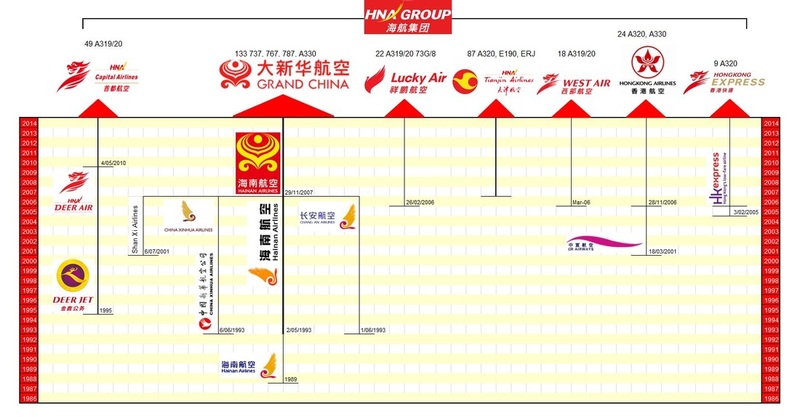 The HNA Group has converted two of its airlines into low cost carriers (West Air and Hong Kong Express) though at present they remain small components of the group.